Which Countries Are the World’s Top Food Exporters? The Netherlands is a small, densely-populated country with more than 1,300 inhabitants per square mile (500 inhabitants per square km). More than half of the nation’s land area is used for agriculture and horticulture, mostly in the form of high-tech greenhouse complexes that allow the Dutch to be global leaders in exports of tomatoes, potatoes, and onions. In terms of value, the Netherlands     is the world's second-largest exporter of food, trailing only the United States, a country which has 270 times the landmass. Since 2000, Dutch farmers have reduced their dependence on water for key crops by as much as 90 percent, and they have almost completely eliminated the use of chemical pesticides. The Dutch use “precision farming”  to get the most out of their fields. For example, the global average yield of potatoes is about nine tons per acre. The Dutch produce more than 20 tons per acre. Greenhouse expansion project Fa.Van Nobelen, BV, The Netherlands - lots of pictures and info! Very cool. I knew the Netherlands had a lot of agriculture, but had no real idea exactly how advanced they'd gotten. I'm impressed. Yes, it is truly amazing what they have done. This appears to be the only way forward in our overheated planet for those fortunate enough to live near the poles. President Trump on Tuesday celebrated a report from the International Energy Agency which claims the U.S. will become the world's leading oil producer by 2023. Some brave people are fighting this insanity in the courts. I wish them well. Trump 呂 will do all he can to destroy them. A federal appeals court Wednesday rejected the Trump administration’s attempt to dismiss a lawsuit filed by a group of kids who want to force the government to do more to fight climate change. China is developing technology that turns deserts into productive land. One quarter of China is covered by dry, desert-like land and one third of its citizens are effected. Reversing the growth of desertification. China is bringing this technology to Africa too. Agelbert NOTE: The second half of this video deals with some facts about healthy soils everytone should know. In the earlier part of the video I learned that children DO NOT have certain enzymes in the liver, that human adults DO have, that are extremely important. "There’s no specific testing done for children,” he says. “There’s absolutely no published scientific evidence to show any level of safety. On the other hand, studies show there is no lower level that is safe for children. Children, when we talk about the unborn, the newborn and grown children up to puberty, they do not have the detoxification enzymes in their livers that we have as adults. Particularly for young children, that means they have no way of detoxifying even the smallest amount of a pesticide or a chemical. The evidence shows that even small amounts, when children are exposed in the womb, through breastfeeding or at a young age, it severely affects the way they develop. It affects the nervous system, the hormone system and the reproductive system. When you look at the science, there are so many areas that can be negatively affected by these small amounts. Unfortunately, a lot of these effects last a lifetime. And also, we know some are intergenerational. Those children's grandchildren will be affected." How Do We Go Beyond Purely Theoretical Sustainable Architecture? TU’s Solution: Go Out & Build It. What can architects, and especially architecture students, do to respond to global issues such as informal urbanization, carbon emissions, or refugee settlement conditions? From sketches to real-work implementation, CODE architecture students design but also construct themselves climate-oriented, resource-saving and affordable projects in Bolivia, Iraq, Chile, and Europe. Their strategy — make the most of a space’s natural properties, culture, and climate; in other words: find local solutions to global issues. Professor Ralf Pasel, head of CODE Institute, just came back from the latest project in Bolivia. Hi Ralf, thank you for taking the time to answer our questions. Can you first introduce us to CODE? CODE — CONstruction & Design is an institute at the Technical University of Berlin, which spans a bridge between theoretical education and practical work. What it actually does is combine three things: teaching, research, and practice. The projects are proper professional works but they are also case studies throughout which students research issues such as carbon emissions. Then…we build them. What comes into consideration before you decided “let’s build an agriculture school in Bolivia”? 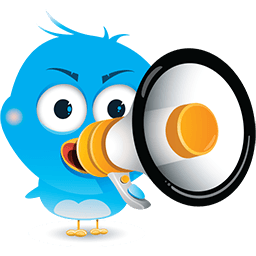 First of all, we set quite strict criteria, which means that we have a sort of CODE X through which we choose projects. 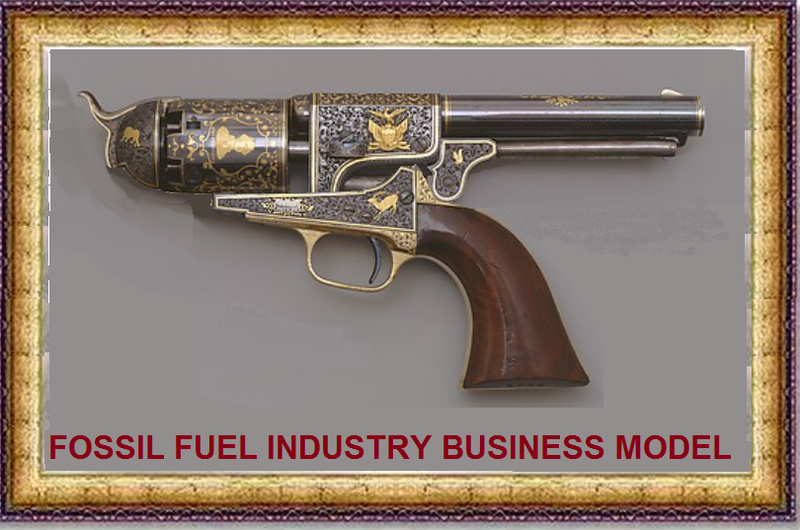 We try to be very careful about not being competitive to avoid any market or monetary dimension. The most important are the social and the environmental relevance; they are the driving forces behind these projects. How is it possible to implement environment friendly designs in poor areas? Does it not require expensive technologies that make these projects difficult to reproduce locally? Not really, our challenge is really to develop strategies that promotes climate orientated buildings that do not rely on high tech, standardized and costly processes. Our challenge really is to think in term of design rather than techniques, consider what is already offered by the location, orientation, and climate rather than what we need to bring or to buy. How did you apply this idea to your project in Bolivia? For the project in Bolivia, which was to build an agriculture school in the Cordillera, we were at more than 3,000 meters above the sea level, with a difference of temperature between day and night time of almost 30 degrees, and winds blowing in all different directions because of the surrounding mountains. So we asked ourselves ‘how can we deal with these such extreme thermic conditions?’ Well, for instance, the school was built with a closed facade, only windows to internal patios so that we can harvest the heat gain in the evening. We also built a double ventilated roof to make sure the heat does not accumulate in the daytime. Then, there should be no need for radiators or ventilators anymore. We also benefit from an incredible solar radiation, so we oriented the roof to make sure the solar panels get the most of it, and we implemented dry toilets to reduce the use of water and generate compost for the agriculture school. Does your project address environmental issues or does it simply adjust to its environment? I would rather say that it is an ‘environment induced project’ because the design is made in such a way that it uses the potential of nature and climate. So rather than fighting extreme weather conditions we just try to ‘sail the boat’. We analyze the impact of sun to orientate the solar panel roof or the direction of the wind to create efficient ventilation systems. We can do that by learning to read the direction of the wind on the grass or by looking at the flight of the birds to see the different thermic winds. 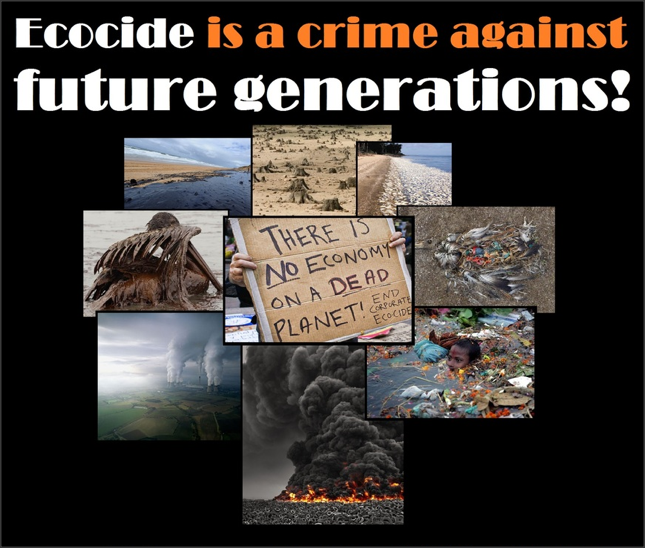 Further to the environmental impacts, which other positive impacts did you achieve? What we do is that we very quickly integrate local partners in the process. For instance, we worked with a women bricklayers cooperative, helping them set up their business and provided them with proper security uniforms. We focused on material and tools that do not require being dependent on suppliers so that they can reuse these techniques for their own houses. Meanwhile, this same women’s cooperative trained the next group of students coming to Bolivia, so we have a sort of circular education movement. We also involve local universities or the students of the agriculture school to come to help and learn about sustainable construction methods. At the moment we are trying to transfer the experience we had in South America into the European context. Because of the refugee situation in Germany we need a lot of social housing projects. We are currently developing two projects for these ‘urban newcomers’ through the initiative Home Not Shelter. 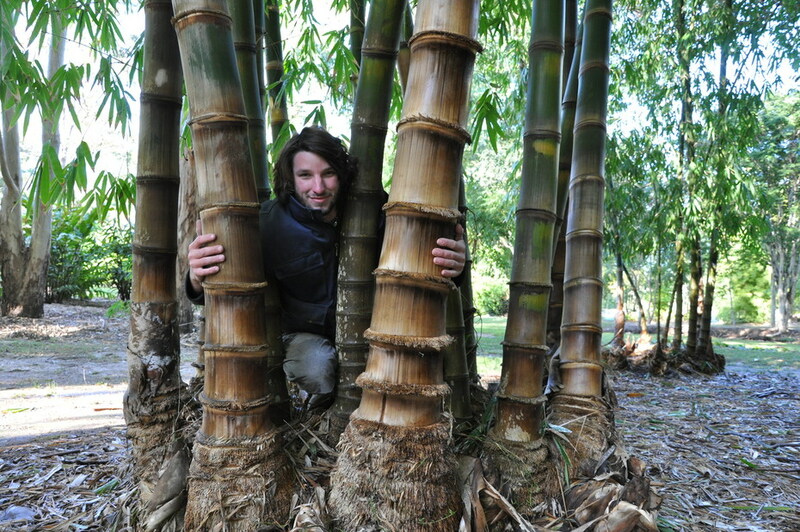 giant bamboo (Dendrocalamus asper) is BIG! Bamboo is fast-growing, so it provides a rapidly renewable source of fuelwood and timber. 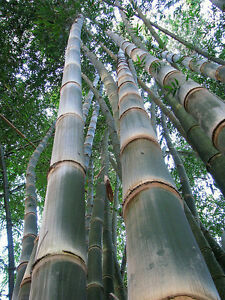 While hardwood trees can take 30 years to mature and must be replanted post-harvest, giant bamboo matures in only a handful of years and can be harvested every year for its entire lifecycle. Michoacan-based Biofase , located in the heart of Mexico's avocado industry, is transforming the dense seeds into disposable drinking straws and cutlery that are said to be 100 percent biodegradable. Learn about super prepping dude Jonathan Richards, that carved his place out of the wilderness. I learned about him on Radio Echoshock. Jonathan isn’t a big fan of buying packages of “survival” seeds. Most folks do not know how to grow them, or when the narrow time of planting is. I always keep some extra seeds, and try to harvest more each year from vegetables that are “heritage”. The “hybrid” plants sold by most seed companies can give a better yield, but their seeds may not produce good veggies the next year. Hybrids do not breed true, their seeds are unreliable. Seeds from heritage plants are more reliable. Jonathan Richards’ survivalacres blog has been influential for me and many others. He also has posts at foodassets.com. He reminds me of super prepping dude Jonathan Richards, that carved out his place out of the wilderness. I learned about him on Radio Echoshock. Macho Man is meant to be the idealized example of the Doomer Prepper. Similarly, his Doomstead is also an idealized example. In reality of course, few Doomers could have such a perfect setup in such a perfect location. However, there are a few examples of people who have come close, and I suspect Jonathan Richards is one of them. In a sense, Macho Man is a combination of the two Doomers from my "How I Survived Collapse" nevel, Kenny & Karl. He's not as young as Kenny or as old as Karl, put him in his 30s-50s, and in great shape of course. His Doomstead is the virtual image of Karls, although it is more traditional and he doesn't have the Doomstead carved into the Maountainside like Karl did. The Doomstead isn't as remote as Karl's, he's actually part of a small community in his neighborhood of family farmers and the people who work for the Park Service, which is what supports the town of Palookaville, along with retired folks who are mostly ex-loggers who worked in the area. The Tourist money from the vacationers and the Social Security and Pension checks of the retirees is what support the ancillary employment in Palookaville while BAU is still ongoing. Macho Man himself clearly has some source of income, he's not as filthy rich as I made Karl. His land he inherited from his father, who was a Logger, it is free & clear. He earned his Nest Egg to start building on it past the small cabin his dad built by working for 15 years as an OTR Trucker, living in his Freightliner. He now earns money from the Doomstead selling his Organic Meat products to some high end restaurants in the two Big Shities in either direction up the Interstate, where he delivers these products by order every couple of months. He also collects waste from these places to use for composting, mulch and pig feed. The cows are all grass fed, of course. He also makes money from his lumber milling bizness and from Ganja he has a license to grow hydroponically in his hydroponics facility. Besides that he is an expert carpenter and wood carver, and does custom cabinetry work to order as well. No particle board or plywood for Macho Man, only good solid hardwoods are used in his cabinets. It's expensive stuff of course, but coveted by the 1% and he marks it up a minimum of 100%. He's also an expert welder and machinist and mechanic, and restores old cars in his shop as well. So he is doing very well here these days financially, enough to buy his tractors and all the other stuff for CASH, no credit or debt for Macho Man! Anyhow, I am having a lot of fun fleshing out this narrative and doing the artwork for it. I unfortunately was blessed by god to be a cripple now, and doing this stuff IRL is impossible for me now. But now I live in the world of my imagination, and I am blessed also with the abilities necessary to do this sort of design work. It's all self-taught of course, I never took a course in CAD or landscape architecture, I don't have a Credential. But I don't need one, because I am not interested in making money, just in educating people about the oncoming Collapse of Industrial Civilization. There is much more still to come on this, although probably not at the feverish pace I pulled this one off at. 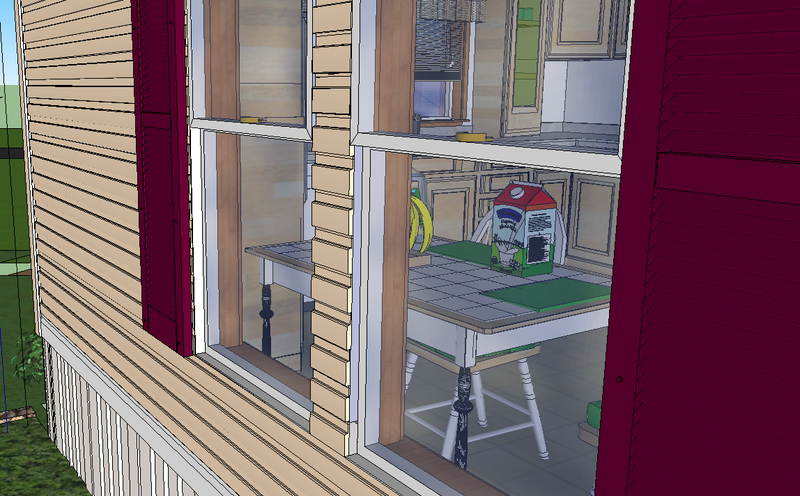 I have been doing CAD work for the last 3 days straight when I am not sleeping or doing the Cooking Zone shows. You have to fill up your day somehow you know, or you go stir crazy with cabin fever. Same here on CAD. I do a lot of 3D in my spare time. I have rebuilt my home piece by 3D piece from the cement slab to the metal frame and outriggers to the belly board and floor insulation, water lines and plumbing to the wall and window framing, wall insulation and wiring layout to the roof trusses and ridge vent. Inside the home I've done some furniture and even the Stonyfield milk container on the kitchen table! That's nice work AG! You're better at it than me! 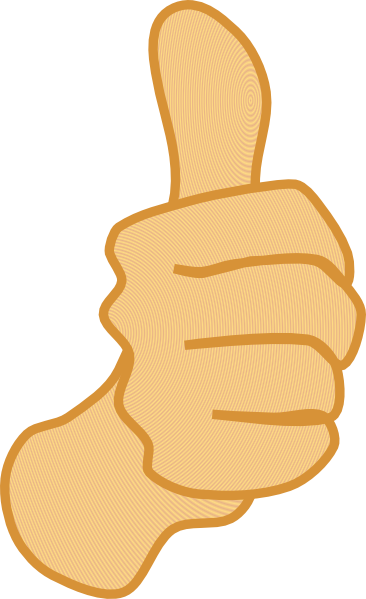 If you wanna contribute a design to add to the model, feel free. You can send me the Sketchup file, I'll incorporate it. I'll see what I can come up with. I'm going to read back on this thread a bit to see what I have missed in your planning. Then I'll try to come up with something that you can use and pass it on to you. A must is the Solar Oven, of course! It WILL get food up to 300 degrees F in subfreezing temperatures, as long as the sky is clear. Just angle it directly at the sun. I have adjusting pegs on it for that. The only high tech part of the Solar Oven is the reflective film. While we still have civilization, it's cheap and easy to get (stock up!). The rest is some carriage bolts, wing nuts, screws, plywood, some two by fours and lots of food quality cardboard for insulation. NO, the carboard will not catch fire. Don't believe anybody that tells you it will. 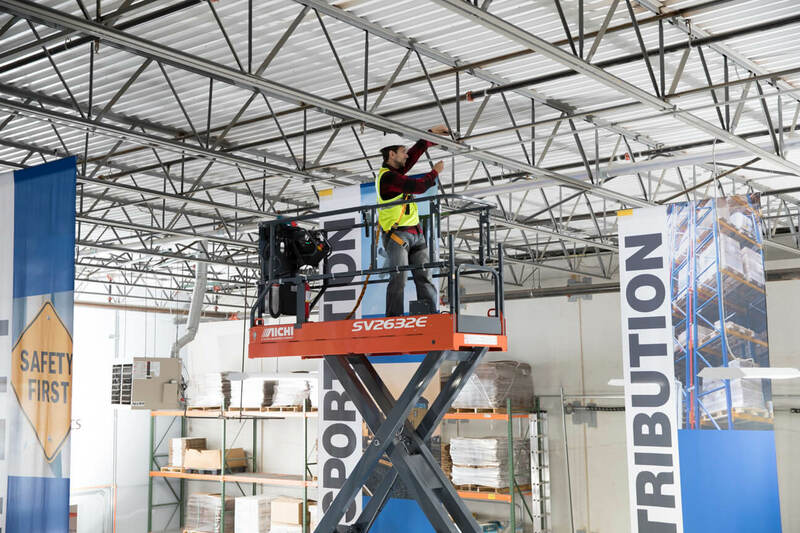 To do routine maintenance here and there, Macho Man, who isn't gettin' any younger, needs to be able to reach high places in more comfort than a ladder provides, especially if he is carrying heavy tools or wood. What he needs is a homemade lift platform. It can be made mostly of wood, though it requires a small electric motor and a strong long metal threaded rod of about an inch in diameter and a secured nut on the threaded rod. The lift platform makes it easy for Macho Man to rake snow off his roof. It can also be used to trim tree branches or possibly top a tree. I've made a few designs. Some go higher than others and some are all metal. This is a low tech (no fancy hydraulics) and (just about) zero maintenance piece of equipment.  You just need to keep it out of the weather and keep the threaded rod from rusting with a bit of grease. Animal fat works in a pinch. Below is a screenshot of them. Some have the "up" and the "down" position on them displayed. 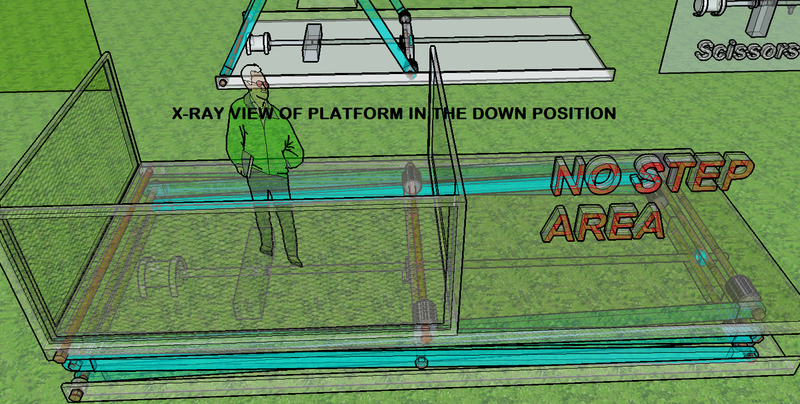 The extra area on the wood platform is a "no step" area. It's there just so the thing covers the base when down, but you could just as well not build the "no step" area in the platform, as I did on the all metal scissor lifts. 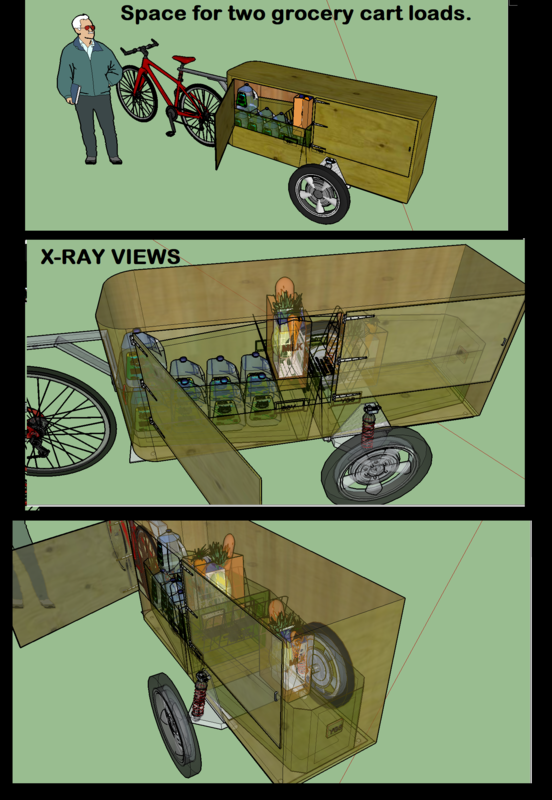 Also, you can put wheels on them, like I did for the Solar Oven, for ease of moving them around. If you want one, just tell me which one you want. I've numbered them. The horse and barn are from the 3D Warehouse. A lift platform would be good. I can put Macho Man on one to work on his Wind Turbine. Just make sure it goes up high enough, the Turbine is about 40' high I think. I can put the Solar Oven next to the Smoker in the Outdoor Kitchen. That still needs a BBQ also. I'll e-mail you the solar oven Sketchup file. 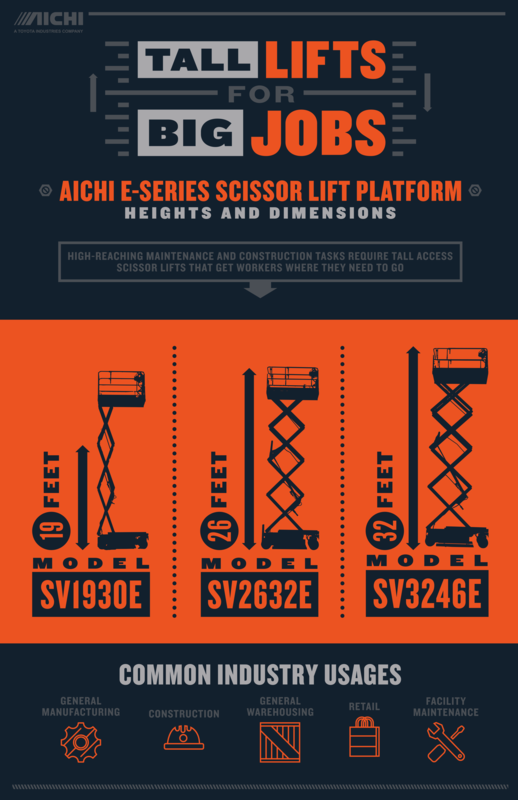 I need to go back to the 3D workshop and make a scissors lift that can go 40' high, if you are talking about the elevation of the base of the platform. 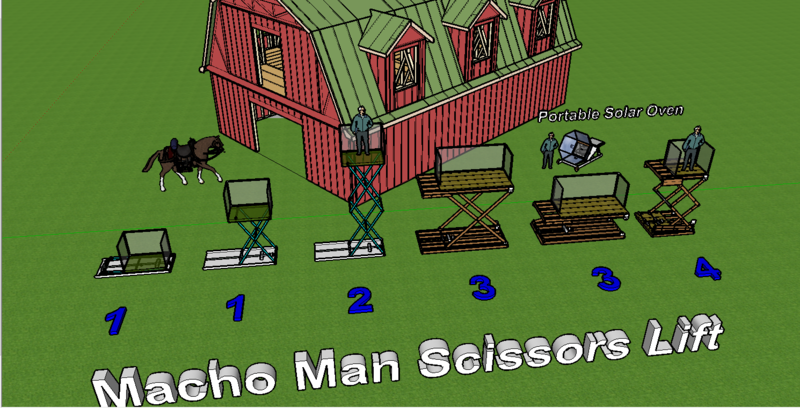 A man standing on the multi-scissors one I designed has his feet 12 feet from the ground. Forty feet is way up there and the scissor joints will need some added frame reinforcement guides to keep from wiggling or falling over. That's why the power companies use bucket hydraulic arm lifts to get up to the power lines. I'll get back to you when I figure out how to do that without hydraulics. To be clear, do you want the base to be 40' high or do you want the shoulders of the man on the lift to be 40' high at the highest point? 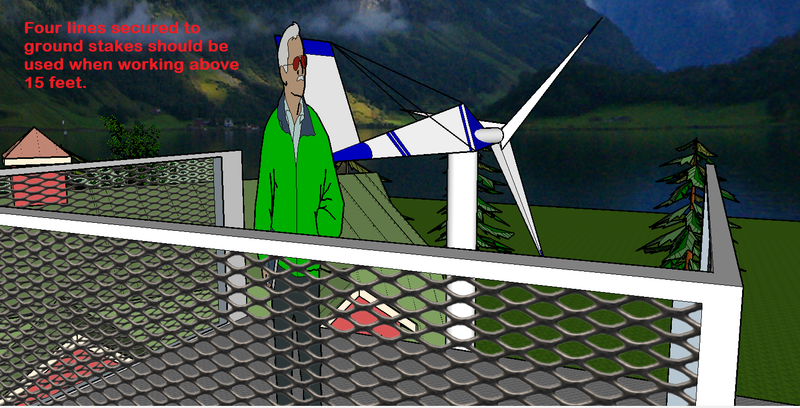 He should have his waistline at the height of the turbine. That way he can lift up or down to remove it or replace it. You can estimate the height of the turbine from the pics, but I will get an exact figure on that when I finish my current project, which is getting all the gear together for the Musher Banquet Adventure. The Turbine Motor is at 33' 1 3/16" off ground level. Okay. Figuring that there are about 3.5' to the platform base from the man's waist, I guess you want the scissors platform base to be 30' high, right? That sounds like it will work. Okay. I'll work on it. I'll see if I can find a nice BBQ for you too. Okay RE, I've got the super duper scisssors lift you ordered all built! 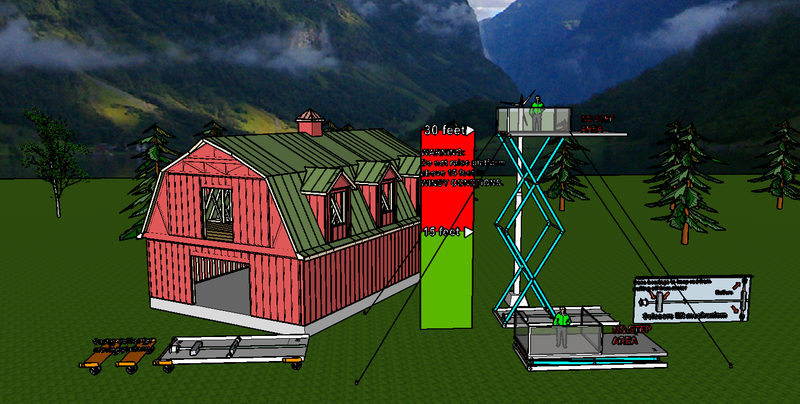 I used the same barn plus a height marker to give the proper perspective. Below are several views that show how it works, how to secure it and how to lug it around. These 3D files are in "groups". You can "explode" the groups to move the parts around if part of the mechanism seems obsccure. Grouping them makes it easier to move a mechanism with lots of parts around. After "exploding" a group. it is a good idea to "make group" them before closing the file. If the following graphics meet with your satisfaction, I'll e-mail the group of the 30' Scissors lift in the down position and the one in the up position separately. 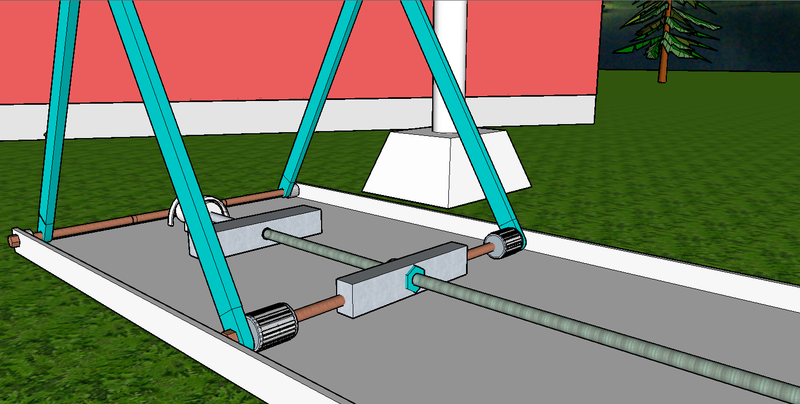 I will also send you the caster dolly gizmos I came up with for the platform separately. Enjoy! Okay RE, I've got the super duper scisssors lift you ordered all built! Not to be too critical AG, but those scissor legs look mighty skinny to keep that platform stable at 30'. That's the all metal version. You are looking at steel, bro. It does get a bit unstable after the cross members exceed the 45 degree angle, hence the warnings I provided. The cross members that are about 16 feet long or so can be purchased of sufficiently thick gauge steel to do the job. Wood won't work for the height you want because a 16' long piece of wood would REALLY have to be THICK, never mind how HEAVY it would be. At any rate, this lift could easily be rated for 500 pounds on the platform. Rememder, this is not a building. It is not meant to have anything but the absolute minimum structure you need to get up there and do a few hours worth of work, period. 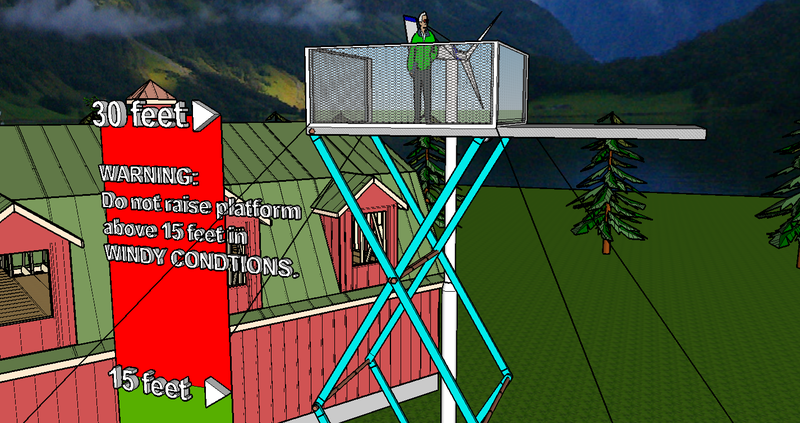 The idea is to have an affordable lift platform, not some super safe (i.e. EXPENSIVE!) industrial quality reinforced platform. Now, if you want a 1,000 pound or more rating, YEAH, you would need I-beam type steel cross members. OK AG, I'm sold. Send me the files and I'll see about incorporating them. It may have to wait until my new SuperComputer arrives. This one is at it's limit with files.